David Willey has been ruled out of England's tour of the West Indies and will be replaced by Steven Finn. Yorkshire all-rounder Willey, 26, will be out until April after having surgery on a partially torn shoulder tendon, an injury suffered in India last month. England will play two one-day matches in Antigua in March, with a third in Barbados, before the teams face each other again in England in the summer. The West Indies are ninth in the ODI standings, four places below England. Middlesex seamer Finn, 27, is currently playing for Islamabad United in the T20 Pakistan Super League in the United Arab Emirates. 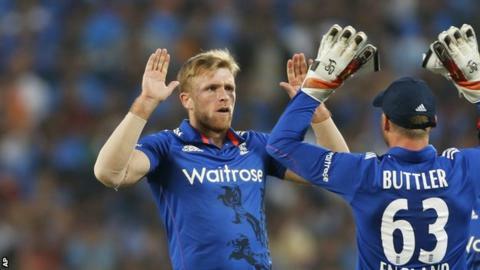 Willey managed just two overs in England's one-day international win over India on 22 January before a problem with his left shoulder forced him off. The injury also ruled him out of the subsequent Twenty20 series. England ODI squad: Eoin Morgan (Middlesex, captain), Moeen Ali (Worcestershire), Jonny Bairstow (Yorkshire), Jake Ball (Nottinghamshire), Sam Billings (Kent), Jos Buttler (Lancashire), Liam Dawson (Hampshire), Liam Plunkett (Yorkshire), Adil Rashid (Yorkshire), Joe Root (Yorkshire), Jason Roy (Surrey), Ben Stokes (Durham), Steven Finn (Middlesex), Chris Woakes (Warwickshire). Is Root the right man for England? Read more on Joe Root: Is England Test captain the right Alastair Cook replacement?